This fab Advent Calendar is for the men folk, busting full of man-stuff to keep them buff, well smelling and looking nice anyhoo, groomed we should say! Man’Stuff by Technic Man Sized Advent Calendar for all his pamper needs! A man sized toiletry advent calendar for the ultimate festive countdown. Open a door each day to reveal a variety of different toiletry goodies including hair & body wash, post shave balm, shaving cream, body lotion, foot lotion, hand & nail cream, hair gel, soap, mouth wash, bath salts, hand sanitiser and accessories. Includes toothbrush, folding brush, comb, bath salts, nail scissors, shower sponge, nail clippers, tweezers, mini emery boards, nail brush, 2 x soap, mouth wash, hand sanitiser, 2 x bath fizzers, hair & body wash, post shave balm, shaving cream, body lotion, foot lotion, hand & nail cream, hair gel and a pumice stone. Available now on Amazon for just £20.27 (I know weird price right!) 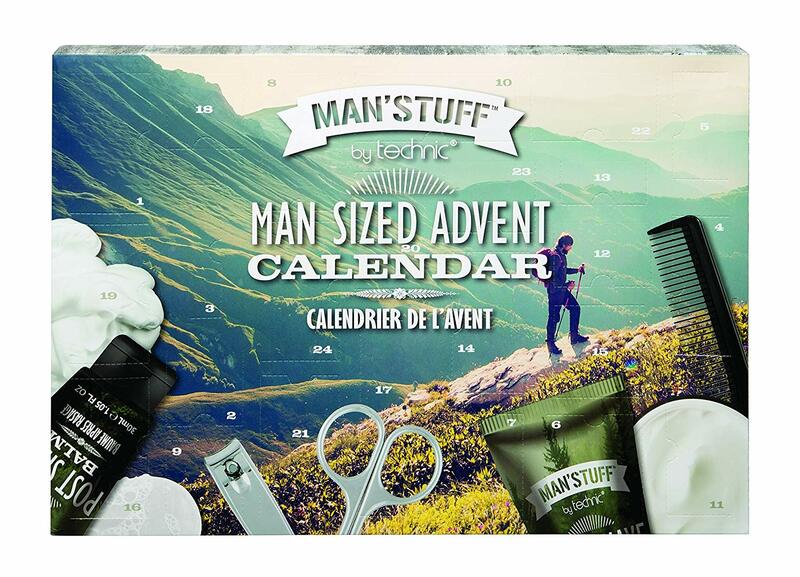 the Man’s stuff Mega Toiletry Advent Calendar is sure to please him.